Markdown is a lightweight markup language, allowing people “to write using an easy-to-read, easy-to-write plain text format, then convert it to structurally valid XHTML (or HTML)”. An excellent Markdown Syntax Guide is by Daring Fireball. Sites such as GitHub, reddit, Diaspora, Stack Overflow, OpenStreetMap, and SourceForge use Markdown to facilitate discussion between users. GitHub uses “GitHub Flavored Markdown” (GFM) for messages, issues, and comments. It differs from standard Markdown (SM) in a few significant ways and adds some additional functionality. As Markdown becomes more popular, new tools have been developed to cater to writing. This post won’t enumerate all or most tools at hand. Instead, I will just list a couple of my personally favorite Markdown editors on different platforms. 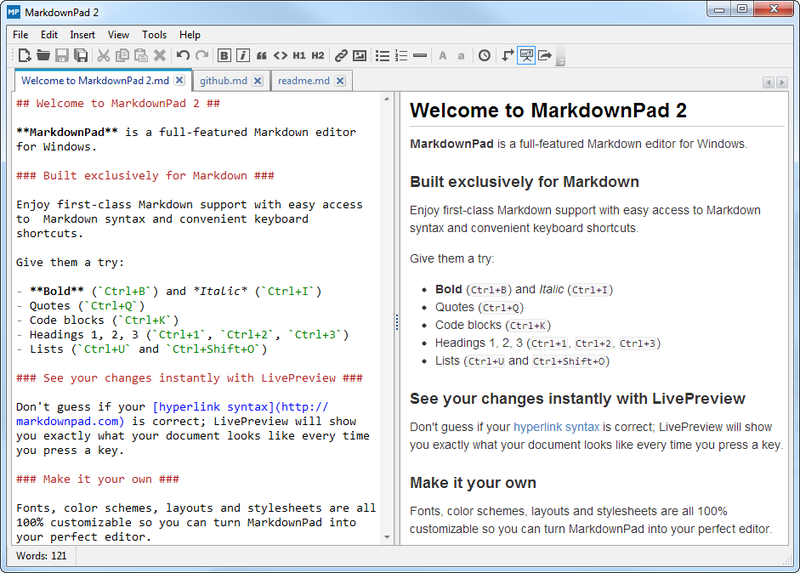 MarkdownPad is a full-featured Markdown editor for Windows. It supports instant HTML preview, spell check, custom css, etc. Markable is a remarkable online Markdown editor. It supports syntax highlighting, line preview, and file sharing with Dropbox and Evernote. For small task, it is my favorite editor. Such a great internet log. I invest hours online reading weblogs, about a lot of various topics. I need to to begin with give compliment to whichever company created your own theme and second to a person for composing what i will only describe being an fabulous post. I truthfully believe there’s a skill to writing and submitting articles that only not many posses as well as honestly you were given it. The mixing of demonstrative as well as upper-class content material is through all probabilities super rare using the astronomic quantity of blogs about the cyberspace. Nice publish. I had been searching often for comparable blog as well as I’m fired up! Helpful data especially the final part when i look with regard to such data frequently. I happen to be searching for that this sort of for a long time. I could keep the attention of the site. Thanks and best of luck! There is another possibility for people who likes to use Microsoft Word and would like to write Markdown documents – Writage (www.writage.com) – new add-in for Word, which enables to edit Markdown documents . So they don’t have to become familiar with Markdown syntax, just write as usual and save as Markdown. Morever, Romanysoft MarkdownD supports most of the editor controls you’d be familiar with from a word processor, like headings, bold, italic, links, images, bulleted/numbered lists, comments, and code blocks, etc.